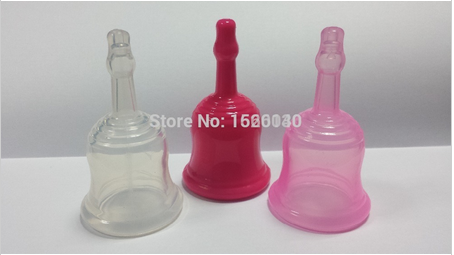 I came across this cup while browsing on AliExpress: http://www.aliexpress.com/item/Dilan-2015-New-year-women-cup-menstrual-instead-cloth-menstrual-pads-vaginal-pills-feminine-hygiene-product/32258584682.html . It really doesn't look like any other cup that I know: the body is an odd shape, and the stem looks...hollow? I haven't heard of the company Dilan it's associated with, either. It looks a lot like what I posted as "kfeng" a couple of months ago. Only it disappeared and very few could see it. If it's that one then it discharges through the stem, is that a hole in the end of the stem? It looks like they've tried very hard to put a sort of valve there. Tho you really can't tell on the red one. The VL cup has two holes either side whereas the kfeng looked to just have one that discharged directly downwards. I hope it is the kfeng under a different name as that would be awesome to compare to VL! I saw these on AliExpress while looking for my iCare--clear and turquoise, though. It looks to be another take on the Victoria's Love design, and probably a lot more wearable because it's not 90cm long. (The VL is even too long for me during my period!) It's an intriguing idea and could work very well if your flow has NO clots at all. Unfortunately I think either I'd get clots that would plug up the valve and defeat the purpose, or the little ball would come loose while walking around and it would leak. Hahahaha thats hilarious!!! "Side discharge? No way! Thats the old times" poor VL cup, I still have to try mine on my period, I went for the small and its tiny lol, so cute, body is 40x30mm with stem brings the length to 75 they say but it was only a couple of mms longer than my small sckoon and holds the exacts same amount! I'm going to use it for preperiod to see when I start bleeding as I wont have to remove it, I'll just look at the stem :). Now I want one of these!!! love this shape! don't trust the site unfortunately. If they used Paypal I'd be all over it. Thank you for this second page ;o), showing more. Has anyone ever seen the second generation cup, with the discharge tube?? Has it been purchasable, or did it stay a simple prototype? Hum.. This present cup has a nice general shape. I wonder if it has zero hole under the rim, like the Victoria's love. I'm fairly curious about the Dilan name origin, too. But to contact the company, it seems one has to be connected-registered on aliexpress, and I don't feel like doing so..
“Thank you very much for your interest with our product. at the moment we have only one size. the softness is even. the tube is soft also and user can squeeze and rub it for clean up. the rim is a little bit firmer as you can see from picture it is a little bit thicker. there is no vent hole near the rim because it is no need. the discharge outlet itself is a big vent hole to balance air pressure. capacity is 25 to 30ml. where did you read this work “dilan”? if you let me know related info maybe i know its meaning. the 2nd generation was designed by Korean company and it is available on market. It is difficult to use, and has a risk if the stick got loss and leak.